Hey beauties! 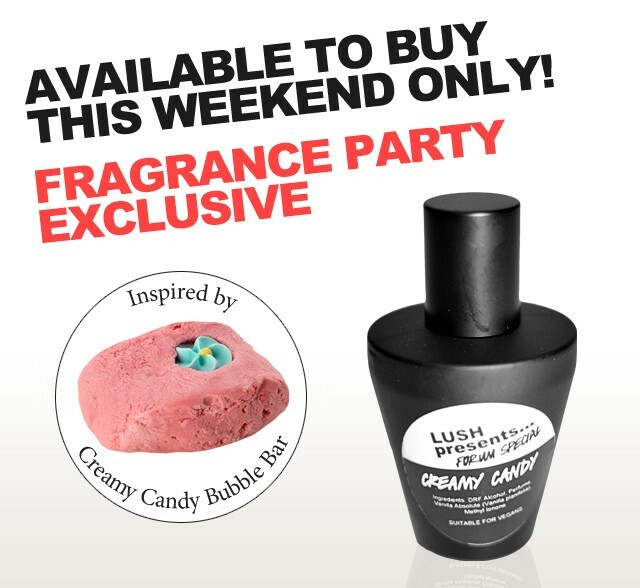 A couple weeks ago I got the exclusive chance to check out Lush's new Limited Edition Creamy Candy Perfume. 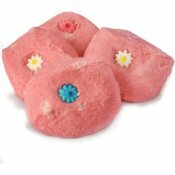 For one day only, Lush sold exclusive scents including Rose Jam, Twilight, Snowcake, Comforter, Big and of course Creamy Candy. I knew I had to pick at least one, I originally planned on purchasing both Creamy Candy and Snowcake, but Snowcake quickly sold out, so I stuck with only Creamy Candy. The reason I went with this because the name and ingredients sounded slightly familiar to my favorite Lush scent Candy Fluff. (No longer available) It also sounded close to my beloved Snow Fairy. Anything candy scented at Lush has to be mine as soon as it hits the store shelves, or should I say internet. Although it shipped from Canada and took a disappointing 2 weeks, I finally received the scent in the mail. The bottle is recognizable because it fits in with the rest of the Gorilla scents from Lush. Scaring me a bit, only because the Lush Gorilla perfumes are a bit too strong for my liking but then I thought back to American Cream which is one of my favorites and I realized I should look past the bottle. To some people, the bottle may seem a bit small for the cost, (about $30 bucks) but the scent is so strong that only one spritz should last you the entire day. So what does it smell like? It is almost an exact duplicate to Candy Fluff! woo hoo! If you're looking for something that smells exactly like Snow Fairy you're a bit out of luck. Snow Fairy has more of a bubblegum undertone while the Candy scents are more of straight sugar in a bottle. So if you're trying to figure out what Creamy Candy smells like think of the scent of candy candy sugar sugar and more sugar! A lot of people can't handle sugar a strong smell of pure deliciousness but I can proudly say I can, at least MOST of the time. (Being pregnant right now, any perfume is making me gag) but I can't wait to overcome the sickness and finally be able to wear this yummy fragrance. And I will have to cherish it because there is a chance Lush will never carry it again. Although I'm sure something similar will come out next Winter, or hopefully sooner!!! Did you know Lush also makes a Creamy Candy bath bar? To die for! Buy it here.